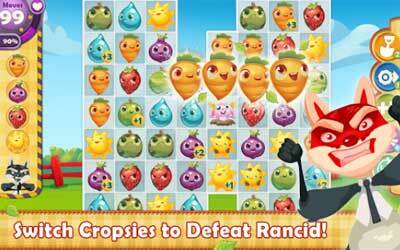 Every day is fun and amusing with Farm Heroes Saga APK 2.57.2. This game and Candy Crush Saga is developed by the same vendor and there are plenty of similarities you can find between each of them. The story begins as Rancid the Raccoon begins to raid upon the precious Farm Lands. As it continues to steal many precious vegetables and fruits, it is up to you and the Farm Heroes have to stop Rancid and return the stolen treasures. And thus, the game begins. The gameplay is very similar to Candy Crush. You will face against falling fruits and vegetables. Simply put, this game is played by combining fruits and vegetables of the same kind on a game board, and this is done in order to make them disappear from the board. With hundreds of levels and additional challenges, you must finish each level to unlock the next map and challenge. It is easy to play at the beginning, but the difficulty level increases as you progress even further. Of course, there’s no need to start from level one all over again, because this game has an auto-save system. This game also has so many gimmicks as you clear the game board from vegetables and fruits. Items exist within the game, and you must get the items to unlock their hidden powers which can help you greatly. There are also leaderboards which will display your latest achievement, and you can compare your highest score with the others online. When you are connected with the internet, you can unlock the whole feature of the game. Some other gimmicks must be unlocked by purchasing them with real money, but those aren’t necessary for you to play it. For a casual game, Farm Heroes Saga for Android is a fun game for everyone. Acres of luscious levels to complete – more added every 2 weeks!